Are you thinking of remodeling your bathroom? Or looking for some really nice bath time experience? Then rain shower heads are the way to go. They are becoming increasingly popular among users because of the way they make you feel. A rain shower head system acts like a little cloud of rain. And by a cloud of rain we mean it makes you feel as if you’re experiencing a real rainfall. Credit behind its rainfall effect goes to the design of shower head. The water passes through many tiny holes and pours down in a way which gives feel like real rainfall. This feeling of standing in the rain is very soothing and relaxing. It is best for people who seek quality bath time after a long day of hard work. Similar to a standard shower head, you can adjust the water pressure of the rain shower head. You can switch the flow of water from soft to hard according to your mood. In addition, there are some high-end models available in the market that offers a rainstorm setting. From the name itself, you can say about the pressure of water. But do not worry as pressure is not high enough to harm your skin. In fact, it provides relaxation as soon as you step into your bathroom after having a hectic day. Generally, rain shower heads are made of steel or have a coat of shiny chrome over them. But due to their increasing popularity, you might come across models made from metal apart from steel. Say, for example, an oil rubbed bronze rain shower head will complete the look of your modern bathroom. Similarly, you get different choices according to the size and theme of your bathroom. Besides having great looks and giving a sense of relief, there is much more you can expect from a rainfall shower. Some models came with in-built led lights and even speaker to boost your mood. However, such models are bit expensive than regular ones but they’re totally worth the money if you have a stressful job. They simply enhance your mood as you bath under soothing light, listening to your favorite music. So we’re here with our list of 10 best rain shower heads reviews to make your bath time hours more relaxing and energetic. 13 What is a shower system with rain head? 14 How to choose the right type of rain shower head for your bathroom? 14.0.1 What shape do your like square or round? 14.0.5 Size of the shower head? 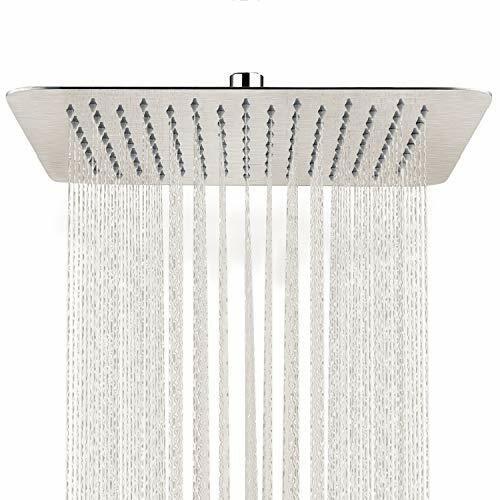 14.0.6 Type of shower head: Handheld or wall/ceiling mounted? 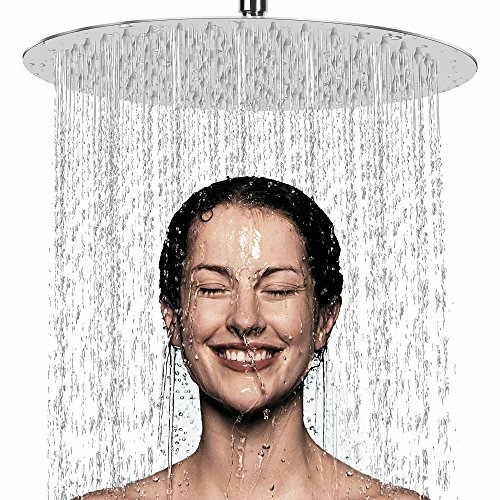 Now as you have gone through the comparison table, here are in-depth rain shower head reviews. The excitement of buying your first rainfall shower head doubles if you get a quality product under budget. So first on our review list, we have a cheap yet durable product from AquaDance. The 7-inch chrome plated head offers 6 water settings. These settings include power rain, pulsating massage, power mist, water saving mode, etc. You can easily switch between different setting by turning nozzle. Apart from a powerful head shower, you get a premium handheld shower. So basically, it is a rain shower head combo. You can use it either directly or hang it above and use it as an overhead shower. And similar to the main unit, the handheld sprayer also features 6 different water settings. However, you’ll feel more water pressure while using the handheld sprayer as the rate of water is high. And nothing is more relaxing than high pressure of water falling on the body at the end of a stressful day. To make things super easy for you, AquaDance features tool-free connection. Therefore, you do not need any special tools to install this rain shower head system. You can perform installation all by yourself without the need to call a plumber. In addition, it comes with necessary installation materials like plumber’s tape, washers, etc. Carefully follow steps mentioned on installation manual and you’ll get your unit running in under 30 minutes. So conclusively, it is the best rain shower head combo in terms of money, installation, and durability. Upgrade your bathroom with DreamSpa luxury rain shower head combo. While the square shape of the main unit will enhance the beauty of your bathroom, the oval square handheld shower is perfect for cleaning specific body parts. Thanks to the large 9-inch face of the main unit that offers wider water coverage. This, in turn, cleans body properly as well as gives you the feel of rainfall. Thus, a perfect way to boost start mornings. On the other hand, the handheld part features push-button flow control. This feature is great to clean specific areas of the body such as legs after shaving or cleaning hands after working on grass, etc. You need to hold push-button and switch flow settings with the same hand. From gentle mist to high-power rain, the handheld has three different settings for water flow rate. Thus, no need to turn any dials, simply push the button and select the flow you want. Rub-clean jets on both the units eases clean-up of any mineral build up. Gently rub your fingers on jets to remove mineral content and get a consistent flow of water again. Moreover, handheld comes with the flexible stainless steel shower hose. And to ease mounting, DeamSpa includes adhesive brackets. You can even make use of power suction to hang handheld at a specific angle. Do not worry about leakage issues as the solid brass ball joint nut offers reliable leak-free connection. Hence, you are going to experience spa-like rainfall simulation with this DreamSpa product. 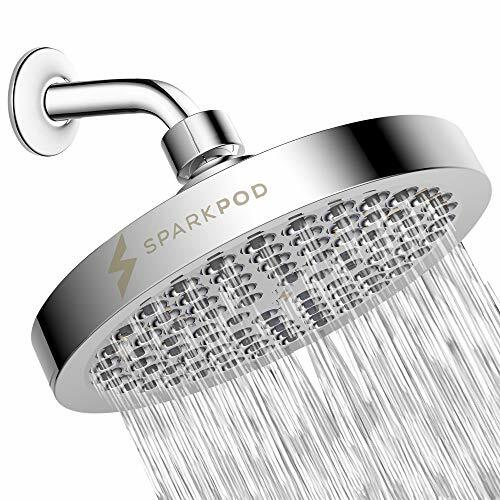 Treat yourself with a luxury spa experience right at home by buying SparkPod high-pressure rain shower head. 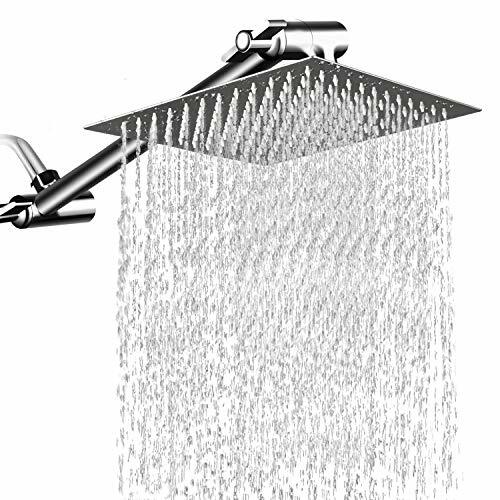 With over 1000 positive reviews it stands as an excellent overhead rain shower system. Its modern chrome look and round shape compliment most of the bathroom theme. But good looks aren’t the only appreciative feature of this SparkPod product. Apart from the great finish, it posses some wonderful qualities which made the product include in our review list. First of all, the product is really inexpensive making it suitable for everyone. You do not have to burn a hole in your pocket to get rainfall experience at home. But do not let this cheap rain shower head confuse you with its quality. In spite of being cost-effective, it offers the highest quality built up. And in addition, it features a brass swivel ball joint that allows you to set the shower head to your desired direction. So though the product is cheap it doesn’t compromise on its quality. Sparkpod comes with all necessary installation components such as Teflon tape, water filter, and water flow restrictor. The water flow restrictor helps to save water but the rate of flow decreases comparatively. But it is super easy to remove the restrictor for a high-end spa experience. All you need to do is remove the old model and install this high-pressure rain shower head. You’ll not need any type of tools and installation will hardly take 10 minutes. In no time you’ll be ready to take your first high-pressure monsoon rain shower. Square structure of SR SUN RISE unit will definitely add a touch of elegance to your bathroom. Credit goes to its square shape and thin size. Yes, the square head is only 2 mm thin which in turn gives you the ultimate experience of rainfall. It delivers high-pressure water even if the flow rate of your home is low. Further, its 12-inch brushed nickel rain shower head covers your body maximally. As a result, it helps to clean your body fast as well as saves water. Brushed nickel plate is made of high-quality materials which are the reason behind its durability. And besides being durable, it is rustproof and corrosion resistant. And similar to other units on the review list, this model also features swivel ball connector. This connector smoothly turns the plate to your desired direction by gentle push of the hand. So one sure thing about this ultra-thin rain shower head is you’ll continue to get rainfall experience for years without any trouble. Unlike the above models, this SR SUN RISE unit is a ceiling rain shower head. But not to worry as installing a ceiling mounted unit is as simple as installing overhead one. It fits easily to most of the shower arm with the help of G 1/2-inch thread connector. Plus you will not need any special tools for wall mounting. Besides that, silicon gel nozzles prevent limescale built up. And in case of limescale accumulates over nozzle then simply rub your finger over it. Doing this will unclog nozzle and your rainfall shower head will work smoothly again. Hectic morning schedule may not allow you to spend hours in the shower. And things become more difficult if you have kids. So the best way to clean your body and relax at the same time is by standing under a rainfall shower. And things get even easier if the head of the shower is large. 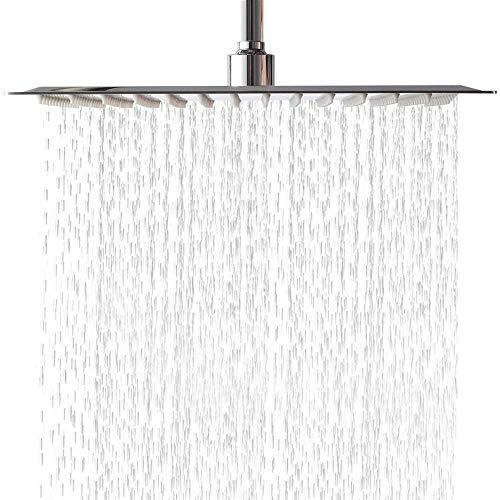 NearMoon 12 inch rain shower head that is large enough to cover you from shoulder to shoulder. Not only it helps you to take your bath fast but it also saves water. And most importantly, rainfall simulation relaxes your mind. Thanks to its air-in technology that delivers water at high pressure. This technology intakes air from outside and helps water spread evenly across tiny nozzles. As a result, it gives rainfall experience even if your home gets low water pressure supply. Thin size of product equally helps in the consistent flow of water. As surface between plates reduce water gets delivered till the last nozzle and gives you ultimate rainfall experience. 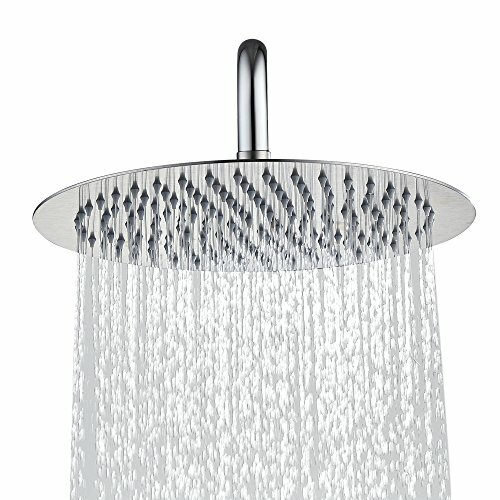 In total, this 12-inch large rain shower head comprises of 153 silicon nozzles. These self-cleaning silicon nozzles clear limescale or mineral build-up by themselves. In addition, each of the nozzles is made from food-grade silicone which is both healthy and safe to use. No wonder why it is one of the best-rated shower head on Amazon. Moreover, the G1/2-inch connector easily connects to most of the shower arms. All connections are simple to perform by hands but NearMoon provides a wrench to ease assembly process. Experience spa-like rainfall treatment without digging a hole in your pocket. Thanks to the affordable price of Lordear square ceiling mount rain shower head. Size and shape of the product are such that it looks perfect in modern bathrooms. Credit goes to its ultra-thin 2 mm edge made by seamless fiber laser welding technology. It is sturdily welded from all 4 sides to ensure no leakage of water. Lordear f01082ch weighs only 3.25 pounds because of its ultra-thin design. Such less weight of product eases its assembly process. You can either fix it on the wall using the arm or hang it on the ceiling if you already have a hanging shower head. While it is easy to install this large rain shower head using an arm, you need to call a plumber in case if you wish to install it on ceiling especially if you don’t have water outlet option on the ceiling. It might be hard for you to get out of the shower when you get such a great sense of relief. But it is important to save water also. So Lordear chrome rain shower head makes use of air pressure technology. This technology mixes 30% air to 70% of water and then dispatches water. As a result, the water comes out in great force while saving 30% of water. But do not worry as force of water is not too high to make you get out from the shower. In fact, you’ll enjoy rainfall simulation even if the pressure of water is low. Save time and water by buying ArtBath 12 inch extra large rain shower head. The surface of the plate is wide enough to cover your body from shoulder to shoulder. All you need to do is install it properly over the ceiling and turn on the tap. Therefore, making it best for people who are always on the run and cannot afford to spend hours under the shower. But apart from saving bath time, chrome polished head looks elegant in modern bathrooms. Whereas, heavy-duty stainless steel construction ensures you get relaxing rainfall experience for years. A standard 1/2-inch connector fits most of the shower plumbing. You can easily install the unit without using any tools. Just use your hands to unscrew old unit, attach a filter to the 1/2-inch connector and then attach chrome plate to it. You get the choice to install the unit on a ceiling or on the wall using an arm. Make sure the position of the plate is in perfectly horizontal while connecting it. Otherwise, the unit will wobble or leak water from sides. Similar to rest of units of on review list, this 12-inch ceiling mounted rain shower head also feature swivel ball. This ball allows you to adjust the angle of the head according to height so that you can get the best rainfall simulation. And on the other hand, tiny silicon nozzles ensure water flows out fluently. Even if one nozzle gets clogged, it is super easy to remove scale or clogging particle by gently squeezing it. So free yourself from the stress of the day by standing under ArtBath ceiling rainfall showerhead. Do you often miss getting wet during rainfall and can’t wait for the rainy season to come back? Then here’s a perfect solution for you. The 12-inch square rain shower head from MeSun gives excellent rainfall simulation. You’ll get that wonderful monsoon to feel as soon as you step into the shower. Credit goes to its ultra-thin square design and 12-inch large plate. The benefit of having an extra large shower head is, you don’t have to move around often to clean yourself. In fact, such a large plate will clean your body as well as provide a sense of relaxation. It is obvious that the height of family members differ from each other. And for best rainfall experience, one must always set plate according to one’s height. 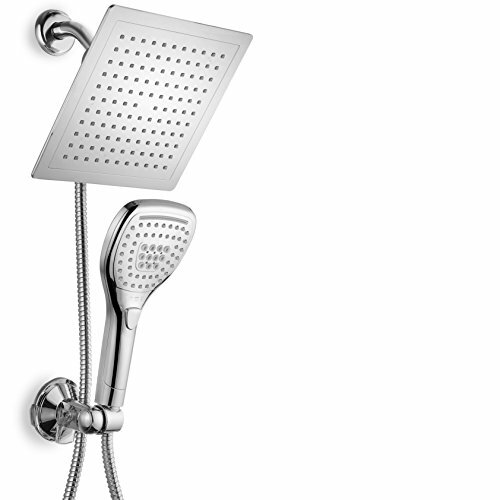 So MeSun comes with 11-inch shower head arm which is adjustable for height and angle on both sides. Durable brass construction of arm will not break away easily. In fact, solid joints of arms allow you to adjust head smoothly at your most appropriate direction. So one sure thing with Moen extra large rain shower head is you’ll never search for an excuse to miss bath time. Mesun provides a complete set-up package so that you can finish the installation process smoothly. In addition, it includes a rubber gasket that prevents the issue of water leakage. Whereas, an additional water filter is useful in case of other filter damages after years of use. You will not need any special tools for assembly as your hands are enough to fix the unit properly. Simply remove the old unit and fix the new one for ultimate rainfall experience. Who doesn’t love to get a relaxing spa therapy after a hectic day at work? But it is really infeasible to visit spa daily due to financial conditions and tight schedule. So to the rescue comes AquaSpa chrome plated square rain shower head which gives you spa-like relaxation. All thanks to its 121 little jets that disperse water similar to that of rainfall. It likes having your own little cloud above your head. And you can get this soothing rainfall treatment without burning a hole in the pocket. Thanks to the extreme cost-effective value of the product. Unlike the majority of the units that only include a shower head, this model comes in a complete package. From durable rain shower head to Teflon tape, AquaSpa includes everything you will need for proper installation. It even offers heavy-duty extension arm for easy angle and rotation. Reliable connection nut and solid brass construction allow you to smoothly adjust plate according to your height. Thus, you can hassle free enjoy your bath time while sturdy metal arm firmly holds the shower head in place. The square shape of the unit compliments most of the modern style bathrooms. As it comes with matching accessories you do not have to waste time searching for them separately. Just remove the old unit and install this new rain shower head system within minutes. Thanks to its tool-free installation system that allows you to fix and install the entire unit using your hands. So in no time, you can enjoy a soothing and relaxing rainfall experience. Key to an excellent rainfall simulation is proper water flow rate and pressure. The Derpras 12-inch adjustable rain shower head comes with a great pressure system. Credit behind water flow consistency goes to its air energy technology. This technology mixes air with water that in turn gives brilliant output. Not only does this make you feel as if you are standing in rain but it also helps to save water. So with Derpras, you can enjoy a long relaxing shower without worrying about the water bill. 12 inch of the shower head is large enough to cover you from shoulder to shoulder. Moreover, its ultra-thin stainless steel construction of plate is resistant to corrosion and rust. And let us not forget about brushed nickel finish on the plate that adds a touch of elegance to your bathroom. Therefore, the shape, size, and thickness of this product are perfect for most modern bathrooms. Swivel 1/2 inch metal ball connector allows you to set a position of the plate at your desired angle. Whereas, the ultrasonic seamless welding ensure no leakage of water from sides. Similar to the rest of units on our best rain shower head reviews, this model also comprises of silicon nozzles. But it provides with 5 extra nozzles in case any of silicon jet gets damaged while cleaning. So start your day with refreshing rainfall experience with the Derpras large shower head. What is a shower system with rain head? While your regular shower disperses water in the form of a strong jet, a rain shower head system makes you feel as if you’re standing in rain. The rainfall system has a large head that comprises of much tiny silicone nozzle. Water passes through each of these nozzles which in turn gives a rainfall simulation. How to choose the right type of rain shower head for your bathroom? There are many things to consider before buying a perfect rain shower head for your bathroom. Let us focus on them individually. What shape do your like square or round? There are a lot of different shapes of a shower head. But people generally prefer a square or round shape. This is because they easily mix with different bathroom themes as well as are easy to install. In addition, square or round shape of shower head maintains good water consistency than other shapes. Both shapes look great on most of the bathroom, so it is up to you what shape do you like the most. While most of the good rain shower heads come with only one setting on which the water falls according to the gravitational pull. However, some of the mechanical and electric shower heads come with adjustable water pressure settings. As there is no problem with only one pressure shower heads, however, having the ability to change the pressure is always better. Size of the shower head? Large the size of the rain shower head, deeper will be rainfall simulation. This is because the large surface of plate covers your entire body just like a real rainfall. As a result, you can enjoy your bath time without the need to move around much to clean yourself. Ideally, a 12-inch large shower head can cover you from shoulder to shoulder and give an ultimate rainfall experience. 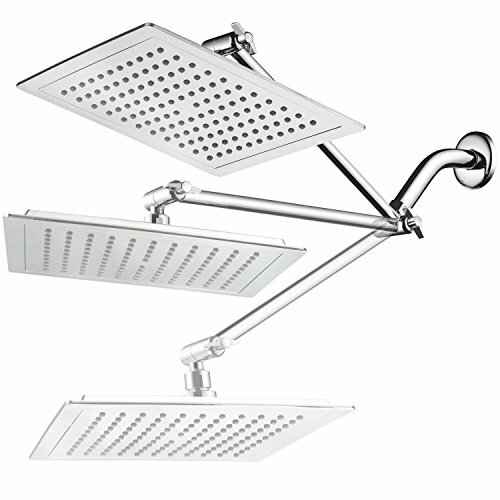 Type of shower head: Handheld or wall/ceiling mounted? You can install a rain shower head system in 3 ways, either on wall, ceiling or by using a handheld unit. All three of them their own advantages which make them different from each other. While a handheld shower is great to clean specific areas of the body, a wall mounted rain shower head is great for a relaxing bath. Wheres, ceiling rain shower head gives an ultimate rainfall experience as waterfall straight on your body. But it might be difficult to install a ceiling shower head yourself as installation is bit complex. On the other hand, it is super easy to install a wall mounted and handheld without the use of tools. 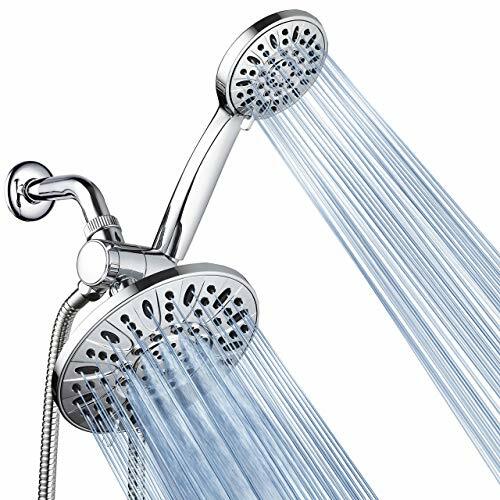 We have included all 3 types of rain head shower system in our review list which will help you decide the best shower head for your bathroom or your needs.